Women's Wear Daily (WWD) is a fashion-industry trade journal sometimes called "the bible of fashion". WWD delivers information and intelligence on changing trends and breaking news in the men and women's fashion, beauty and retail industries with a readership composed largely of retailers, designers, manufacturers, marketers, financiers, media executives, advertising agencies, socialites and trend makers. It is the flagship publication of Fairchild Fashion Media, which is owned by Penske Media Corporation. James Fallon is the editorial director of Fairchild Fashion and the publisher of WWD is Paul Jowdy. Its editor-in-chief is Miles Socha. 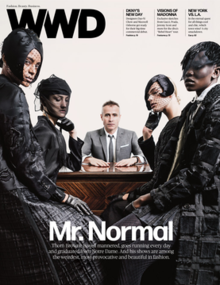 The final newsprint edition of WWD was printed on April 24, 2015 as the paper switched to a digital daily format and a weekly print edition was launched on April 29, 2015. The journal was founded by Edmund Fairchild on July 13, 1910 as an outgrowth of the menswear journal Daily News Record. The publication quickly acquired a firm standing in the New York clothing industry, due to the influence of its first advertisers, including the Philadelphia and New York Wanamaker's, and an esteemed group of fashion journalists who included Edith Rosenbaum Russell, who served as Women's Wear Daily's first Paris correspondent. Apart from her work for the paper, Rosenbaum was a leading freelance fashion buyer, a pioneering celebrity stylist and a press attaché for the powerful Chambre Syndicale de la Haute Couture Parisienne. Though WWD's lesser reporters were sometimes assigned to the last row of couture shows—a sign of the newspaper's highly specialized appeal within the American garment trade—the paper realized greater popular appeal by the late 1950s. John Fairchild, who became the European bureau chief of Fairchild Publications in 1955 and the publisher of WWD in 1960, improved WWD's standing by focusing on the human side of fashion. He turned his newspaper's attention to the social scene of fashion designers and their clients, and helped manufacture a "cult of celebrity" around designers. Fairchild also played hardball to help his circulation. After two couturiers forbade press coverage until one month after buyers had seen their clothes, Fairchild published photos and sketches anyway. He even sent reporters to fashion houses disguised as messengers, or had them observe designers' new styles from windows of buildings opposite fashion houses. "I have learned in fashion to be a little savage," he wrote in his memoir. John Fairchild was publisher of the magazine from 1960 to 1996. Under Fairchild, the company's feuds were also legendary. When a designer's statements or work offended Fairchild, he would retaliate, sometimes banning any reference to them in his newspaper for years at a stretch. The newspaper famously sparred with Hubert de Givenchy, Cristóbal Balenciaga, John Weitz, Azzedine Alaia, Perry Ellis, Yves Saint Laurent, Giorgio Armani, Bill Blass, Geoffrey Beene (four times- the first over Lynda Bird Johnson's White House wedding dress design, which Geoffrey promised to keep secret until the wedding day, and later over the size of an ad in another of Fairchild's publications, Beene's allowing a rival publication to photograph his home, and a WWD reporter Geoffrey did not like), James Galanos, Mollie Parnis, Oscar de la Renta, and Norman Norell (who was demoted from "Fashion Great" to "Old Master" in the journal's pages), among others. In response, some designers forbade their representatives from speaking to WWD reporters or disinvited WWD reporters from their fashion shows. In general, though, those excluded "kept their mouths shut and [took] it on the chin." When designer Pauline Trigère, who had been excluded from the paper for three years, took out a full-page advertisement protesting the ban in the fashion section of a 1988 New York Times Magazine, it was believed to be the first widely distributed counterattack on Fairchild's policy. In 1999, Fairchild Publications was sold by the Walt Disney Company to Advance Publications, the parent company of Condé Nast Publications. As a result, Fairchild Publications became a unit of Condé Nast, though WWD was technically operated separately from Condé Nast's consumer publications such as Vogue and Glamour. In November 2010, WWD celebrated its 100th anniversary at the Cipriani in New York, with some of the fashion industry's leading experts including designers Alber Elbaz, Ralph Lauren, Marc Jacobs and Michael Kors. On August 19, 2014, Conde Nast sold Women's Wear Daily to Penske Media Corporation (PMC). The purchase by PMC included WWD's sister publications Footwear News, Menswear, M Magazine, and Beauty Inc as well as Fairchild's events business for a sale price close to $100 million. On April 12, 2015, Women's Wear Daily announced on their website that they will launch a weekly print format from April 23 on. A Daily Digital edition of WWD is also available to subscribers. On July 20, 2015, Penske Media Corporation (PMC) and Tribune Publishing Company announced that WWD will appear on LATimes.com and will also be distributed to select Los Angeles Times, the San Diego Union-Tribune, Chicago Tribune and Sun-Sentinel subscribers 12 times per year. ^ Miller, Lia. Women's wear dayA "Women's Wear Daily Setting Its Sights on the Luxury Market." Archived 2013-12-16 at the Wayback Machine The New York Times. (March 14, 2005). ^ a b c d e f g h i j Horyn, Cathy. "Breaking Fashion News With a Provocative Edge". The New York Times. (August 20, 1999). ^ a b c d e f g h Rothenberg, Randall. "From Pauline Trigere, a Dressing Down". The New York Times. (August 17, 1988). ^ a b Hoover's In-Depth Company Records. "Fairchild Publications, Inc." March 21, 2007. ^ Trager, James. The New York Chronology: A Compendium of Events, People, and Anecdotes from the Dutch to the Present. HarperCollins (2003), p325 Archived 2014-07-08 at the Wayback Machine. ISBN 0-06-074062-0. ^ Women's Wear Daily, August 22, 1911. ^ a b c d e f g h i j k l Gross, Michael. "Women's Wear Daily and Feuds in Fashion". The New York Times. (May 8, 1987). ^ Former WWD publisher James Brady. Quoted in Rothenberg, Randall. "From Pauline Trigere, a Dressing Down". The New York Times. (August 17, 1988). ^ Barringer, Felicity. "Fashion Magazine Industry Consolidates with a Big Deal". The New York Times. (August 25, 1999). ^ MacIntosh, Jeane. "Will WWD Play It Straight for SI?". New York Post. (Feb. 7, 2000). ^ "Condé Nast sells Women's Wear Daily, others to Penske Media". USA Today. Archived from the original on August 20, 2014. Retrieved August 19, 2014. ^ Fritz, Ben; Trachtenberg, Jeffrey A. "Penske Media to Buy Fairchild From Condé Nast for Nearly $100 Million". Wall Street Journal. ISSN 0099-9660. Archived from the original on 2015-12-08. Retrieved 2015-12-01. ^ Staff, WWD (2015-03-12). "From the Editors: WWD Launching Weekly Format". WWD. Archived from the original on 2017-07-15. Retrieved 2017-06-28. ^ "Women's Wear Daily to Become a Weekly". The Cut. Archived from the original on 2018-01-29. Retrieved 2017-06-28. ^ Chang, Andrea (2015-07-20). "Women's Wear Daily content to appear in L.A. Times, other Tribune papers". Los Angeles Times. ISSN 0458-3035. Archived from the original on 2017-10-19. Retrieved 2017-06-28. Isadore Barmash; Edward Gold; Marvin Klapper; Sandy Parker; Sidney Rutberg; Mort Sheinman & Stanley Siegelman (2005). Fashion, Retailing and a Bygone Era: Inside Women's Wear Daily—A Look Back. Baltimore, MD: Beard Books. ISBN 1-58798-269-2.